On April 27-th in San Francisco, Startup.Network and Hack Temple, held one of the most important business events of 2017, the Intercontinental Startup Battle. This is an international investment battle, in which nine of the most promising and investment-attractive startups from the Eastern European countries have fought. The board of the Startup Battle experts in San Francisco included: Max Gannon - co-founder of Acquired IO, Alexey Ilyashov - Chief Data Architect Tesla, Shuonan Chen - Investor from Agile VC, Mike Sandler - CEO of Epiphan Video, Mitchell Vainshtok is a venture capitalist and managing partner at HP, Pavel Cherkashin is the CEO of Hack Temple and Managing Partner of GVA Capital, Alexander Soroka is the CEO and founder of Startup.Network, Vadim Rogovsky is a partner of WannaBiz, a business angel, Anna Dvornikova is Managing Partner In @TEC Ventures, Julian Zegelman - Managing Partner of Velton Zegelman PC, Matthew Soul is a senior strategic analyst at L'Atelier BNP Paribas US, Daniel Stolyarov is the investment director of Almaz Capital, Stas Hirman is an investor, serial entrepreneur and co-founder of three startups in Silicon Valley, Nick Bilogorsky is the founder of the Cyphort engineering group, entrepreneur in Nova Ukraine and MUTE GROUP, founder and managing partner of 408 Ventures; Roman Sobachevsky - investment director of GVA.Capital. 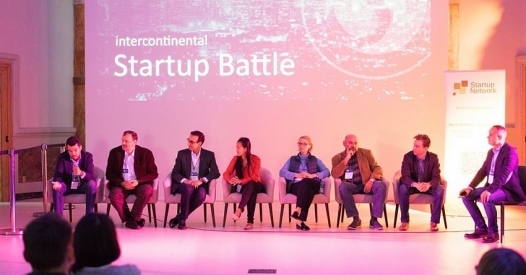 During the "Entrepreneurial section" of the Intercontinental Startup Battle, a panel discussion took place, with participants from venture capital funds from the Silicon Valley. They told whether it’s true, that the venture capital funds that are located in the Valley, do not invest in startups what are not located in Valley; shared effective methods of investors search; explained whether it makes sense to seek money in other locations in the US, such as Boston, New York, talked about local Corporate Venture funds and about; what kind of startups are in the trend today. BIOsens is a mobile laboratory for express diagnostics of food safety, thanks to which it is possible to carry out the necessary examination within just 15 minutes. The device connects to a smartphone or tablet on which the corresponding program is installed. Mubert is an Internet music composer with AI technology. This is not a radio, the algorithm creates music in real time.This is a unique sound stream that you can control and adapt to your lifestyle. Nexus - an innovative startup, designed to solve the main surgical problem - intuitive management. The goal of Nexus is to create a "bridge" between surgeons and effector movements. It includes all the advantages of robots and manual laparoscopic instruments to minimize the risk of failure of medical equipment and improve the quality of current operations. We hope that this was a good experience for all participants. They received feedback from the leading investors of Silicon Valley, got acquainted with representatives of local venture funds, and some even received invitations to meetings to discuss cooperation. Thanks to the performance at the Intercontinental Startup Battle, the winners of the competition - the BIOsens team - got one of California's investment funds, that already interested in their project. Also Startup.Network is very grateful to the partner of the event - Hack Temple. We have already begun work on finding new promising investment ideas. The nearest Battle of the Startups will be held on May 18th - the 76th in Minsk (Belarus) and the 77th in Kharkov. And the next Startup Battle in San Francisco will take place this fall.